This week, I was appalled to see that the Babylon Bee, a Christian satire web site, was attacked by Facebook for writing a satire critical of the radically leftist CNN. This is what Facebook sent to Adam Ford for his satire of CNN. 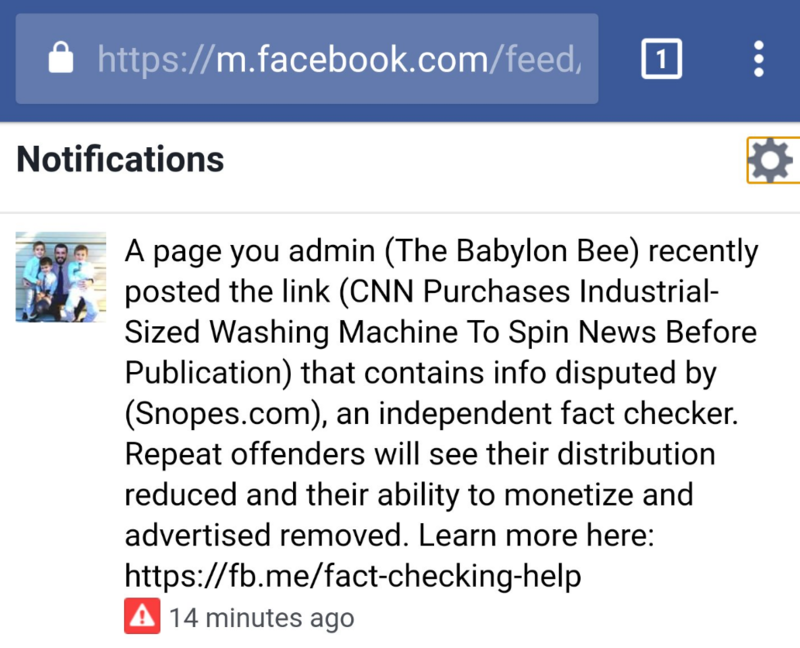 Since Facebook cited Snopes, I thought it might be a good idea to talk about two Facebook “fact checkers”, and an example of their “fact-checking”. First, a story from The Daily Signal. Then, we’ll see examples of how Facebook’s censorship allies are biased against conservatives. Let’s look at the first far-left Facebook partner: Politifact. Politifact is just a group of journalists from the Tampa Bay Times newspaper. 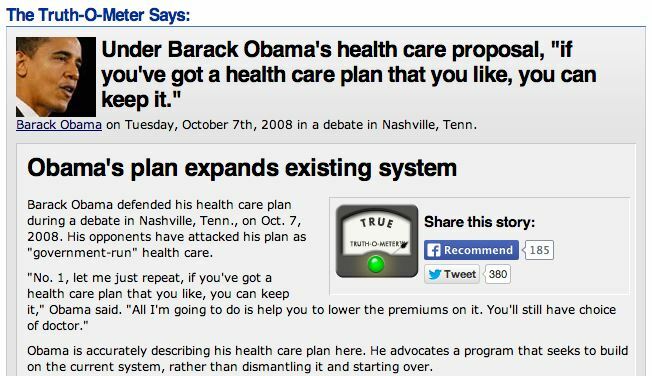 Avik Roy, health care policy expert at Forbes magazine, writes about Politifact’s assessment of Obama’s promise to Americans about keeping their health plans after Obamacare. […]As per PolitiFact’s usual M.O., Holan didn’t seek out any skeptical health-policy experts to suss out the veracity of Senator Obama’s signature claim. Instead, its sources included Jonathan Cohn, a passionate Obamacare supporter at The New Republic, and various interviews and statements of Mr. Obama. Holan simply took the “keep your plan” promise at face value, dismissing as dishonest anyone who dared suggest that Obama’s claim would be impossible to keep. “His opponents have attacked his plan as ‘government-run’ health care,” she wrote, the scare-quotes around “government-run” being visible to all. 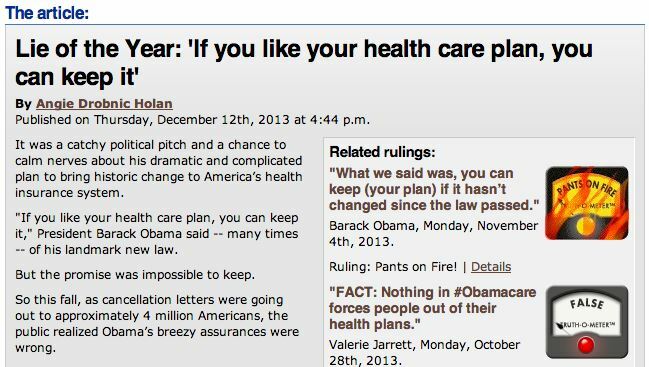 […]On November 4, Jacobson rated as “Pants on Fire” the President’s new claim that “what we said was, you can keep [your plan] if it hasn’t changed since the law passed.” Both pieces were edited by Angie Drobnic Holan, who had initially granted PolitiFact’s seal of approval to Senator Obama’s 2008 promise. Holan delivered the coup de grâce, declaring as PolitiFact’s “Lie of the Year” the “keep your plan” promise. So when Politifact rates a statement by a Democrat as true, what they really mean is that it’s pants-on-fire-false, but it’s election time so they don’t say that. It’s not like the critical assessments of Obamacare from health policy experts were not out there between 2007-2012. It’s just that the liberal journalism-major bloggers at Politifact couldn’t be bothered to read them. And this is who Facebook is using as a fact checker, because Facebook has one way of seeing issues – the radical leftist way. If you disagree, then they censor your content. Because Facebook employees are close-minded, anti-intellectual socialists who hate free speech. What about Snopes? Maybe Snopes is a more reliable “fact checker” than Politifact? […]Lacapria — in another “fact check” article — argued Hillary Clinton hadn’t included Benghazi at all in her infamous “we didn’t lose a single person in Libya” gaffe. Lacapria claimed Clinton only meant to refer to the 2011 invasion of Libya (but not the 2012 Benghazi attack) but offered little fact-based evidence to support her claim. Snopes is just spin for Democrat gaffes – playing defense for the DNC. And Facebook using them to check facts, because Facebook is basically joined at the hip to the Democrat party. Can we verify that Snopes actually lies in order to defend Democrats. Well, yes –right here. Snopes lied about American flags being present throughout the first day of the 2016 Democrat convention. It’s groups like these who are being relied upon to spot “fake news” for Facebook. When you are on Facebook, it’s important to understand that it is a web site run by Democrats, for the benefit of Democrats. There is no balance. There is no critical thinking. The simple fact of the matter is that many fake news stories are pushed by the leftist mainstream media, and ignored by the leftist “fact checkers”. Here’s one recent example of how that works. First, the story from The Daily Signal. Then, we’ll see examples of how Facebook’s censorship allies are biased against conservatives. […]Facebook is working with outside fact-checking organizations accredited by Poynter’s International Fact Checking Network to help it determine what content is fake. They include ABC News, FactCheck.org, PolitiFact, and Snopes—all of which have been accused of liberal bias in the past. Yes, the same ABC News that employs for Clinton hatchet man George Stephanopolous. That’s who will be doing the “fact checking”. An example of a “fake news” site, by the way, is The Daily Wire, which is run by Harvard Law graduate Ben Shapiro. Let’s look at another far-left Facebook partner: Politifact. Politifact is just a group of journalists from the Tampa Bay Times newspaper. So when Politifact rates a statement by a Democrat as true, what they really mean is that it’s pants-on-fire-false, but it’s election time so they don’t say that. It’s not like the critical assessments of Obamacare from health policy experts were not out there between 2007-2012. It’s just that the liberal journalism-major bloggers at Politifact couldn’t be bothered to read them. What about Snopes? Maybe Snopes is more reliable than Politifact? Snopes is just spin for Democrat gaffes – playing defense for the DNC.